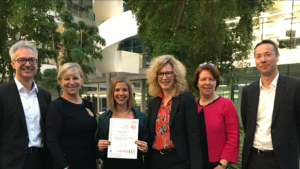 The EQUAL-SALARY Foundation has the pleasure to announce that its main partner, PwC Switzerland, obtained the EQUAL-SALARY certification. PwC works to promote EQUAL-SALARY certification among companies, and has also been entrusted with performing EQUAL-SALARY audits. For evident reasons of impartiality, the qualitative analysis of PwC’s certification was hence operated by SGS. The EQUAL-SALARY certification of PwC Switzerland stands in line with our wish of global expansion. More to come soon! See full release in the resources below.